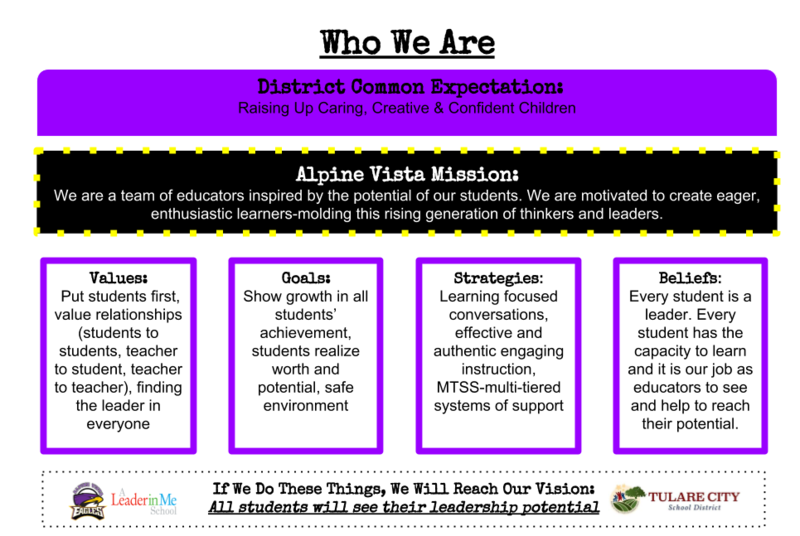 At Alpine Vista, we are a team of educators inspired by the potential of our students. We are motivated to create eager, enthusiastic learners—to mold this rising generation of thinkers and leaders. We want our students to have a variety of opportunities to be involved with our community and many of the great organizations we have. During the school year, our students will be able to participate in events and campaigns that benefit local families and agencies. For a full list of the opportunities we currently are involved with, please see our community involvement list. We are proud of our students and staff and the many things they accomplish. We know that we are successful because of the support we receive from families who care about their child’s education and are willing to lend a hand. Visit our PTO page for more information about how you can make a difference in your child’s journey through education. State law requires that school-level plans for programs funded through the Consolidated Application be consolidated in a Single Plan for Student Achievement (Education Code Section 64001), developed by school site councils with the advice of any applicable school advisory committees. LEA’s allocate NCLB funds to schools through the Consolidated Application for Title I, Part A, Title III (Limited English Proficient), and Title V (Innovative Programs/Parental Choice). LEA’s may elect to allocate other funds to schools for inclusion in school plans. The content of the school plan includes school goals, activities, and expenditures for improving the academic performance of students to the proficient level and above. The plan delineates the actions that are required for program implementation and serves as the school's guide in evaluating progress toward meeting the goals. The purpose of the Student Accountability Report Card (SARC) is to provide parents and the community with important information about each public school. A SARC can be an effective way for a school to report on its progress in achieving goals. The public may also use a SARC to evaluate and compare schools on a variety of indicators. State law requires every school in California to publish a School Accountability Report Card, by February 1 of each year.